Cotton Mirage Seersucker Sleeveless V Neck Blouse. New design! 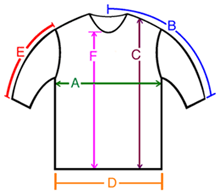 A: Chest / Bust circumference 42-43" 46-47" 50-51" 54-55"
B: Sleeve length from center of neck to end of sleeve 7.5" 8" 8" 8.5"
C: Body length from shoulder to bottom of hem 23" 23.5" 24.5" 25"
D: Hem circumference 47" 50" 55" 58"
E: Sleeve length from shoulder to end of sleeve 0" 0" 0" 0"
F: From the bottom of the V-Neck to hem 16.5" 17" 17.5" 18"